About: The restaurant is located on very convenient place only a 2-3 min walk from London Paddington Station. Serves a really great indian foods with collection of one of the best wines. Phone Number to contact are: 02072623030, 07817148369. I came to The Mughal's to eat with some colleagues after work. Having spent a long day at the office I was really tired and wanted to get home ASAP, so I was hoping they wouldn’t take long serving our food and drinks. To my surprise, the food was served quickly and it tasted just as good as it looked. And it wasn’t just the food that was nice, the atmosphere was friendly and the waiters kept everyone happy. The price wasn't as bad as I thought it would be, and I had no problem paying the service charge as I felt they worked hard to ensure customer satisfaction. If only all restaurants were as good as The Mughal's! 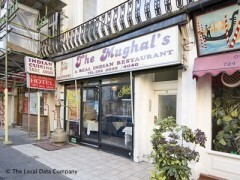 Mughals Restaurant is a brilliant Indian restaurant in Piccadilly, London. The restaurant was overly booked but the staff worked very quickly to sit us down at a nice area. Upon arrival, we were seated in the lounge and our drinks order was taken. We started with complimentary Popadoms with a nice raita and mango chutney. Me and my wife ordered the Vindaloo but it was too hot for our taste-buds so the staff were very happy to change it to something less spicy but tasty. The meal was excellent and the chicken was firm but tender and the sauce was perfectly seasoned and left a mouthful of flavour even after we left. The family next to us where vegetarian and told us how they come every week and the Vegetarian menu was packed full of different Indian tastes that kept them coming back. The only thing me and my wife spoke about where other Indian restaurants that we had been to which were not this pleasant. The fact that it was a cold Saturday night did not spoil the evening. The cultural aspect brings out a more Indian feel to the restaurant. Being of an Indian background I certainly felt like I was treaded as luxury and felt like the main attraction. We've been to London for 4 days (Dez 2009). We have various experiences in indian restaurants, gained within Germany an Austria. The restaurant's performance was in our opinion very very bad. We were guided into a very cold room. The candle on the table was not lighted. It was dark, therefore reading the menu was a problem. After "preliminary" ordering, the waiter (?) explained as - in a very rude way - that our order was too low in price. After a few q&a, we decided to stay and ordered some vegetarian starters, spinach chicken (nan) and a prawn curry (rice). Bad decision. All eating utensils were dirty and very cold. The prawns were very hard-boiled and the spinach was uneatable, too. Rest of orders 3/10. We did not enjoy our stay. We are not able to recommend this restaurant. It is called "The Murghal's - A REAL indian restaurant". That's a nice joke. We were one of two couples in an otherwise empty restaurant. Even so, we were left for 10 minutes before the waiter came to take a drinks order. We ordered, got drinks, fine, but when the poppadoms arrived they were thick, heavy and virtually overcooked. The pickles were obviously the cheapest possible, and the diced onion dish (which is usually finely diced onion, cucumber and tomato) turned out to be roughly cut onion and CARROT. I kid you not. My curry (served on cold plates) tasted like one of those McDougal's curries from a jar, but was supposed to be a jalfrezi. And not hot at all. For all the delay in serving us initially, our plates were removed even while there was food still in the bowls when my friend had not yet finished. Amazing. The bill came with a 10% service charge added. I was ready to dispute this, but she wasn't up for confrontation, so we left. I asked for a receipt and the waiter, the worst I've ever had, just offered the hand written note of the final tally. I had to specify a VAT receipt - they couldn't even get that right. I don't usually write reviews, but my experience at The Mughal's was so extreme that I felt I had to. After a pleasant train trip from Totnes, my 3 friends and I thought we'd finish our weekend with a meal. Mughal was the first restraunt we found (other than Burger King and Garfunkels). The place seemed busy nd friendly enough as we had bags the shoved us into the back room. We sat down started to order then were told forcefully that we had to order a minimum of £10 each –not including drinks stated on every page of the menu highlighted green, this is when we should have upped our bags and left. We strategically ordered our food my girlfriend ordered her meal without rice and 3 times he insisted she have rice. The order was taken rudely and their whole attitude was of trying to squeeze money out of us. We asked for a jug of tap water, but we were sternly told there was no jugs. We asked for a solitary candle to be lit but were ignored. The food came the dal seemed ok, rice oily. We got the bill which was £57.80 and they added 10% service charge (as stated in the menu and highlighted orange). We gave then £60 between us I went to the toilet and when I returned 3 waiter were standing over my 3 female friends trying agressively argue that we had to pay the whole bill including the 10% tip. My girlfreind offered for them to call the police I asked if there was a problem and they went and waited by the door for us to leave. We all wish that we had gone with our gut feeling and left. We are all fans of indian cuisine and culture but this place was greedy rude and the next day my girlfriend and I stomach is not right, so the food is as bad as the service. The Mughal's looked very authentic and busy place, therefore we decided to have dinner there. The waiter was extremely rude and arrogant. For the first time in my life I left a restaurant before having ordered. So I cannot give feedback about the quality of food, but as the quality of service was so unacceptable, I highly recommend everyone not to eat there. There's plenty of restaurants of Indian cuisine in the neighbourhood if you're hungry for curries and naans.